Below are two vintage sanrio erasers that is up for sale on my eCrater Store. The unicorn horse has a sharpener inside in this combo with a star eraser. While Spottie Dottie is clearly sealed with a white clear strip (before the top of the eraser) as shown in picture below. Tip for Newbies: For vintage erasers like Spottie Dottie, if there isn't a white line around the eraser, then it's been opened and don't let the sellers fool you when they say it's still in their original plastic and never been "opened." Both pieces are both retired items and would make an excellent addition to your eraser collection. Next, I have a lovely Pochacco school set. This doesn't appear to have been used as I just got this recently. This was a two-item auction lot and I was only interested in the pencil. 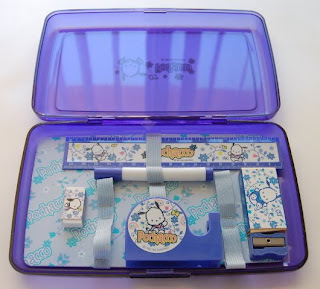 This is really a cute Pochacco case if you take out what's inside and replace it with your own school supplies. If you want to see the front cover of this case, please head on over to my store for more details. I'd keep the case, but I really need to start learning how to let things go and not keep everything in sight. I have to keep on being picky. Or, should I say it more formally-- being selective in my choices. Sounds better, right? Who am I kidding? I'm just plain picky. 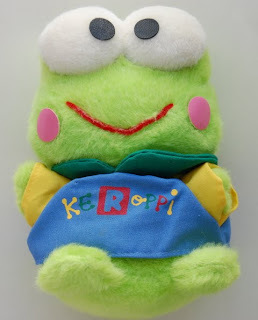 Below is a vintage Keroppi plush doll that has been safely stored away in a plastic bag. It's still in new condition. 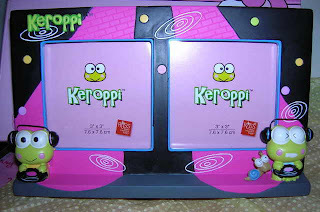 Below is a cute Keroppi Photo Frame produced by Russ, but sold through Sanrio. I bought this in a Sanrio store, thinking I'd used it since it was so cute. I never did because I still have this phobia of displaying one of my favorite things. This being one of my favorite Keroppi items. Too bad I don't have a double copy.